긴가지해송은 한국(대한해협, 제주도), 일본(미사키)에 분포하며 해송과 비교해 볼 때, 잔가지들이 길고 날씬하게 보인다. 남해와 제주도 해역의 수심 15∼100m에 서식하며 높이가 2∼3m까지 자란다. 문섬 일대에서 예전에는 많이 관찰되었다고 하나 레져활동이 활성화 되면서 많이 훼손되어 가고 있는 실정이다. Black Coral is distributed along Korea including Jejudo Island and Misaki in Japan. Compared to White Coral (Antipathes japonica), it has longer and more slender branches. It lives in the waters of Jejudo Island and southern sea of Korea at depth of 15-100m and grows up to 2-3m high. 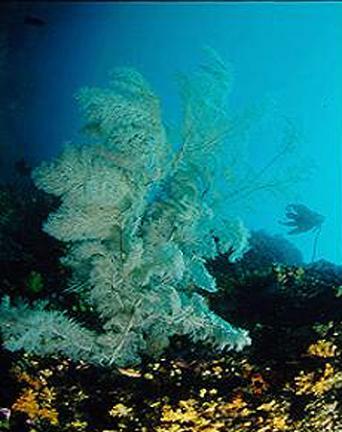 A large number of this black coral used to be reported around Munseom Island, but it is disappearing with the increase in leisure and sports activities in the area.